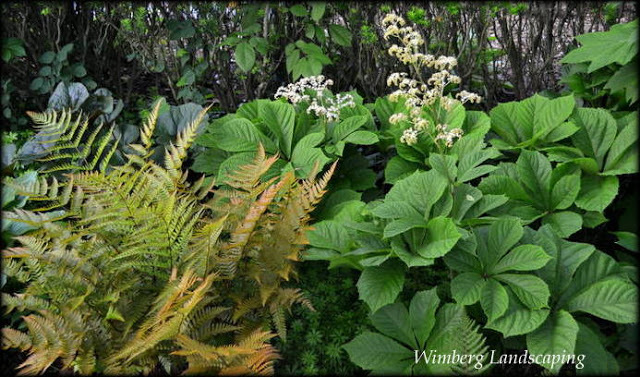 "My shade garden at the park has a stellar cast of characters, from a bold oakleaf hydrangea, to autumn fern, toad lilies and a variety of hostas. But this spring season, it is the rodgersia that is stealing the spotlight. The third year is the charm for this plant. It's boldly coming into itself, becoming a solid anchor and focal point in the garden with its upright form, leaves and stems with substance and weight and a unique texture that catches the eye. The plant has an “old” look to it, not so much heirloom but more pre-historic. As bold, and dare I say fierce, as this plant is becoming, it's displaying a soft, light and airy white late spring/early summer flowers that are adding a lovely new dimension to the shade garden." I asked her if Rodgersia is still a favorite plant and her reply was yes, but with a few caveats. "I noticed over the years, as the Oakleaf has increased tremendously in size, the Rodgersia has suffered. This is a fail on my part for I should have been more vigorous with the pruning of the Oakleaf. Also since I am not at the park 4-7 days a week like I was in years past, the plant has shown decline. Of course not all perennials have the longevity of a peony or Baptisia, but know my absence has caused the plant to suffer. The solution, water it deeply as often as you can, don't let it get crowded out and keep the soil rich- and for me that's as simple as adding pinefine amendments and generous amounts of Milorganite during the growing season." When I see great stands of Rodgersia I always ask myself, why aren't we seeing more of it? In the proper setting it's stunning. Growing rodgersia—The gardens are well watered at the park. I do spot water this plant in the heat of the summer. My garden tags have long since walked off so I am not certain if my rodgersia are Rodgersia aesculifolia (Zones 5-9) or R. pinnata ‘Elegans’ (Zones 4-9). Rodgersia likes full sun to part shade, moist, rich soil (thus the spot watering) and has no notable pests or diseases.